Having waited months since its availability in Singapore, I finally got a review unit together with the Samsung NX20 last week. At 696g, it’s huge and heavy compared to the lightweight NX body – even the heaviest NX11 weighs only 353g. With a minimum focal distance of 0.82m, you can’t use it for close-up shots like my favourite 60mm f2.8 MACRO lens. Focusing speed is not very fast but silent. You can override auto-focus anytime by turning the focusing ring. 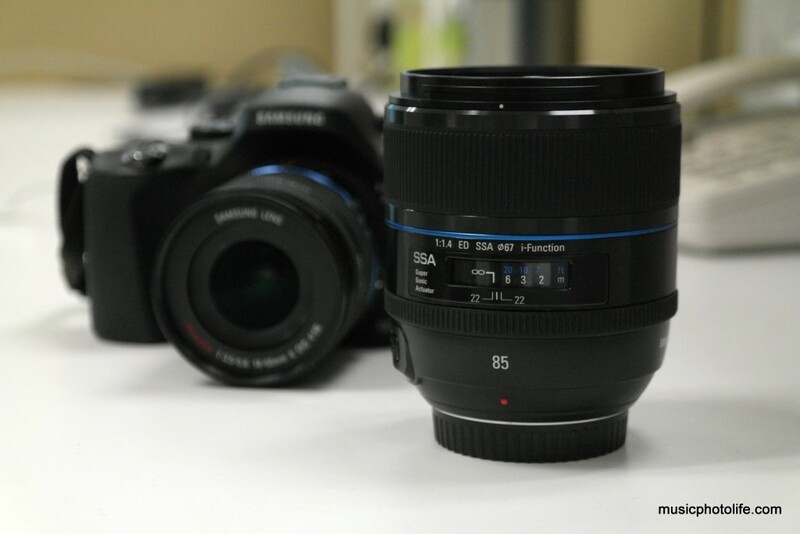 The 85mm lens is huge and heavy compared to the latest Samsung NX20. 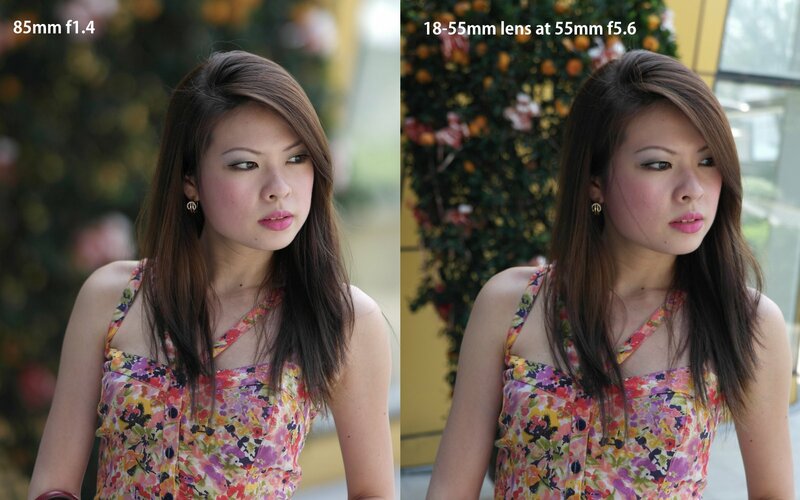 The lens is better in its overall build and optical performance compared to the Nikkor 85mm f1.8 AFD I owned. Less fringing at large aperture, less haze effect when shooting against light, and certainly much sharper. From the photos taken with it, many people liked the bokeh, i.e. the blurness of the out-of-focus background. More photos of my friend here. Another set of photos taken with another friend. What you notice is that the lens focuses sharply at the tip of the eyelashes. The eye ball, despite a mere millimetre difference away, is clearly out of focus. How would a normal kit lens like 18-55mm f3.5-5.6 compare with this 85mm f1.4 portrait lens? Here’s your answer. See the background blur? That’s bokeh. The NX 85mm f1.4 is the most expensive lens among the NX lens, but it is certainly worth it. A camera is useless if the lens does not help you capture the images you want. A slow lens (small aperture) will reduce shutter speed and potentially make your handheld images blur. The 85mm f1.4 is the brightest lens in the Samsung NX line-up. If you love to capture powerful portrait images, then this lens will give you the shooting edge. Samsung NX20 is a nice model camera of Samsung. I like it very much.